Although previous research suggests that we are not very good at reasoning with uncertainty, the research described in this talk is far more encouraging. Unlike earlier work that compares peoples' decisions to a rational standard, these experiments compared decisions made by people with uncertainty information to decisions made by people without uncertainty information. The results suggest that including specific numeric uncertainty estimates in weather forecasts leads to better decisions. 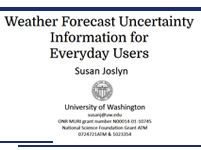 This talk was part of Meteorological Service of Canada's 2015 Workshop on Communicating Uncertainty to Users of Weather Forecasts precursor to the 49th CMOS Congress & 13th AMS Conference on Polar Meteorology and Oceanography. This resource is made available courtesy of Dr. Susan Joslyn, Environment Canada, CMOS and The Eumetcal Project, and is not produced, owned or hosted by UCAR/COMET. I found this talk to be absolutely fascinating in the way the studies were designed to answer the questions and in the outcomes. Anyone who has to communicate forecasts to the public should take 30 minutes to gain a better understanding of how uncertainty can help or hurt depending on how it is expressed. Can people understand expressions of uncertainty? Do people make good decisions with uncertainty information? Does uncertainty information increase or decrease trust? What is the best way to communicate uncertainty information?